Chiricahua National Monument covers a relatively small section of the Chiricahua Mountains in the extreme southeast of Arizona, and contains large expanses of volcanic rocks eroded into dramatic pinnacles and spires, an interesting variety of vegetation and some unusual wildlife species. Not many people visit, since the monument is quite remote and access is difficult - although close to Interstate 10 there is no direct route south and the main approach is from the west, 34 miles along AZ 186 from Willcox. The only other possible paved entrance road is south, from Douglas on the Mexican border. There is one dirt track (Pinery Canyon Road) across the Chiricahua Mountains, linking the monument with New Mexico to the east but this is closed during the winter and in bad condition most of the year. The mountains are particularly susceptible to thunderstorms during the summer months so the area is best visited in spring or autumn. 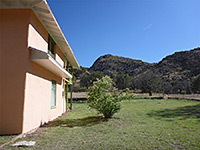 The nearest major towns with hotels close to Chiricahua National Monument are Willcox (34 miles), Tombstone (73 miles) and Benson (74 miles); follow the links for descriptions and reservations. 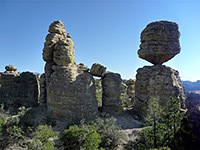 Chiricahua National Monument occupies an area only 5 by 6 miles. A winding, 8 mile scenic drive climbs steadily from the entrance, past the visitor center, campground and several roadside viewpoints to Massai Point (elevation 6,870 feet) where several trails branch off, descending into ravines and towards the main rock formations, which are in general not visible from the road. On the way, the scenic drive follows the course of the stream through Bonita Canyon for most of the route, within sight of various geological features most notably the Organ Pipe formation; a sloping cliff face, weathered into many rocky columns. The cliffs behind the campground are quite easy to climb, and give good views of the Organ Pipes, as well as distant views of the flat desert to the west. 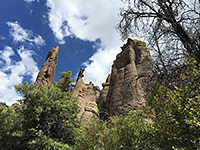 The most striking volcanic pinnacles are in the Heart of Rocks, reached by several moderately strenuous hikes starting at the end of the scenic drive. One trail passes along the rim and later the floor of Echo Canyon, which has many huge boulders and eroded formations including the Grottoes and Wall Street (a straight, narrow passageway), but also plenty of shady trees. A continuation path descends into adjacent Rhyolite Canyon where the route divides; one branch follows the canyon westwards (downstream) for 1.5 miles, rejoining the main road at the visitor center, close to the campground. A daily shuttlebus runs between the center and Massai Point and so allows hikers to return by walking downhill along this route. The other branch of the path (Sarah Deming Trail) climbs steadily for 1.6 miles to the edge of the Heart of Rocks where the vegetation is less dense and huge weathered pillars and spires of rock are visible in all directions. This location is also reachable by a slightly shorter route from Massai Point/Echo Canyon (Ed Riggs, Mushroom Rock and Big Balanced Rock trails), while all places may be seen along the 9.5 mile Big Loop. Trail descriptions - details of all routes. 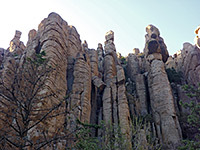 The formations at Chiricahua are similar in size and shape to the sandstone spires of Bryce Canyon and Cedar Breaks in Utah, although without as much color - the rocks are grey or brown, but often with a covering of bright green lichen. They were formed by erosion of compacted pumice and ash, resulting from a huge eruption around 27 million years ago. The 1.1 mile Heart of Rocks Loop route winds through some of the most impressive groups which include several examples of balanced rocks - boulders perched precariously on top of much thinner supporting columns. This area also has good climbing and scrambling opportunities. One other NPS preserve with the same volcanic boulders is Pinnacles National Monument in California. 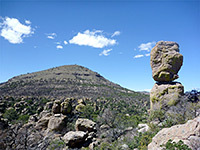 Due to the relatively high elevation, the climate in the Chiricahua Mountains is quite different to that of the surrounding deserts. This means that unusual species of plants and animals are present, many of them native to Mexico and not found elsewhere in the USA. In particular, rare species of birds such as the elegant trogon and Mexican chickadee may be seen, also mountain lions, javelinas and ocelots, although it is of course unlikely that the casual visitor will encounter anything this unusual. Plants include species from the Sonoran Desert to the west, the Chihuahuan Desert to the east and the mountains of northern Mexico; there are around 16 species of cactus, three of yucca and two of agave. 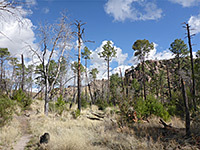 During the 1860s and 1870s, the Chiricahua Mountains provided a refuge for the Apache tribe who, led by the famous chiefs Cochise and Geronimo, carried out the last major series of attacks on white settlers before finally being defeated in 1886, though their descendants still inhabit the surrounding lands. One well-preserved fortress from this era is the Cochise Stronghold, in the Dragoon Mountains 40 miles west of the Chiricahua Monument.